So, the day officially arrived. The day that I’ve been dreading all summer and secretly wishing would take a reaaaaaally long time to come. The day that actually seems to have come within the blink of an eye. The start beginning of my 5-week, accelerated summer chemistry course. Ew…I know. What was I thinking taking a 5 week chemistry course in the summer? Was I actually in the right state of mind when I signed up for class? In the past, one of the things got me through my college class meltdowns, was a quick trip to my favorite Chinese food stop. Something about a bowl full of sweet glazed, deep fried chicken on a bed of fried rice made everything seem just okay for that moment. That was…until the bloating kicked in moments later. Thanks to the deliciously versatile veggie named Cauliflower (not all heroes wear capes), you can totally have a bowl full of nomworthy deliciousness that, IMO, tastes wayyyy better and more fresh than takeout – at a fraction of the calories! As I was eating this, I literally closed my eyes, did my little happy dances (of course) and thought to myself…”I could totally be a vegetarian if I wanted to”. Seriously, with how sweet, delicious and flavorful this tastes, I wasn’t missing the deep fried chicken one bit. 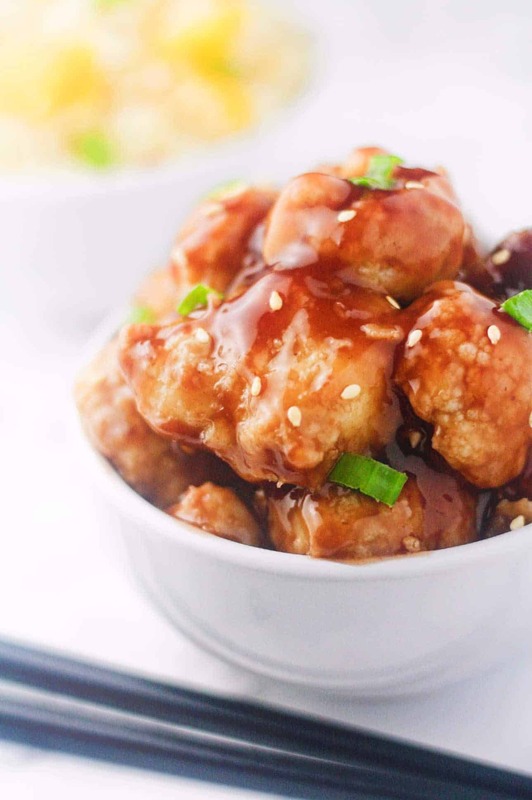 The cauliflower does a fantastic job at soaking up all of that flavor so you’re getting mouthfuls of honey-garlicy goodness in every bite. Baked cauliflower, coated in a honey garlic Sriracha sauce. A delicious and healthy alternative to takeout! Preheat oven to 400 degrees F. Cut cauliflower into bite-sized pieces and set aside. In a large bowl, whisk together flour, milk, salt and egg white. Pour into a large Ziploc bag along with the cauliflower, seal and shake until all of the cauliflower is coated in the batter. You may want to break this down into 3 batches in order to make this process easier. Lay cauliflower out on a baking tray lined with parchment paper. Gently spray the top of the cauliflower with cooking spray and bake for 15-20 minutes or until batter is golden brown. While the cauliflower is baking, mince the garlic and saute until golden brown. Add sriracha, honey, hoisin sauce and onion powder. In a separate bowl, mix together the cornstarch and water to make a slurry. Pour into the sauce. Heat on medium-high until the sauce starts to boil and thicken, stirring occasionally. Remove sauce from heat. Once cauliflower is golden, flip over, spray the other side with cooking spray and cook for an additional 5-10 minutes to ensure the cauliflower is crispy on all sides. Remove from the oven and gently toss in the honey garlic sauce. Garnish with scallions and toasted sesame seeds or if you choose. This cauliflower is delicious eaten alone but can be paired with various side items such as quinoa, brown rice, jasmine rice, salad or even cauliflower rice (if you just can't get enough of cauliflower) for a deliciously wholesome meal! Very surprised by how spicy this was. I love General Tsos, so I was fine. But 1/2 cup sriracha seems high for the average person!